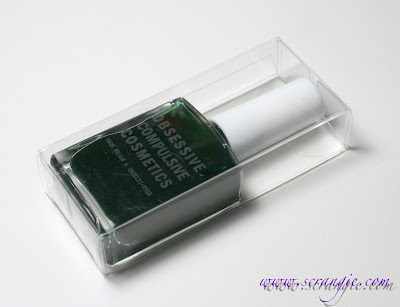 Obsessive Compulsive Cosmetics Nail Lacquer has undergone a little bit of a makeover! I didn't mind the packaging before, but after seeing the new style, I have to say that it is definitely an improvement. One the left is the old-style bottle. Short, chunky, rounded-square shape. On the right is the new bottle. The new bottle is taller and slimmer, has crisp edges and an improved brush. It holds the same amount of product as the old bottle. The new style packaging is similar to the American Apparel or Massini bottles. Edit: Now that I'm thinking about it, the new OCC bottle is identical to the POP Beauty nail lacquer bottle, to give you an idea of the shape and weight of it. The brush in the new bottle is a lot nicer. On the left is the old brush, which was a rounded style brush and not too precise. On the right is the new brush. It's a little beefier, has more evenly cut bristles and is a straight-edged flat brush, similar to an OPI Pro-Wide, just not as wide. Also, as you can see in the top picture, the polishes now come in a protective clear plastic box. 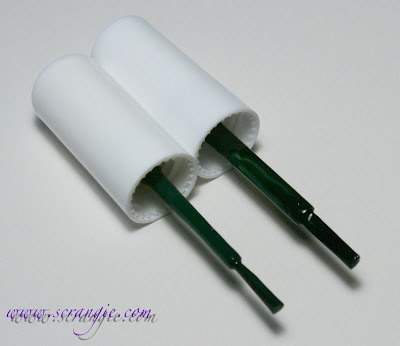 It is sturdy enough for storing the polishes, but it isn't crush-proof. The packaging still has that trademark generic look, but it's a little more sleek and streamlined now. I do appreciate the better quality brush, but there is a downside to the new bottles: they're easier to tip over! Since they're tall and slim, they're not as steady as the old ones. The new ones look nicer, but I do have to be more careful not to knock them over. Obsessive Compulsive Cosmetics Ghostly. This is a very pale lavender-grey creme. More lavender than grey. Ghostly is a good name for this! Obsessive Compulsive Cosmetics Resolution. 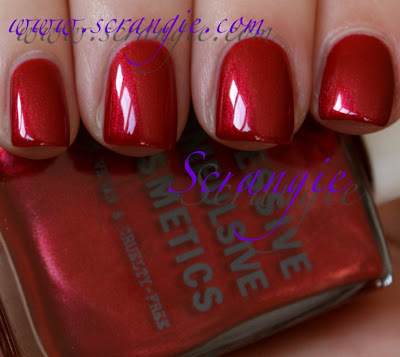 This is a cranberry red shimmer. Not very bright, not dark or vampy, just a plain medium red. 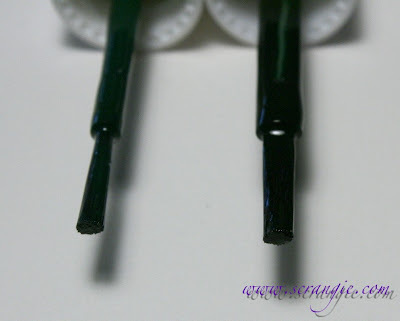 Obsessive Compulsive Cosmetics Flatline Matte Topcoat over OCC Resolution. This is your standard matte-finish topcoat. It lightens the color of the polish slightly, giving it a bit of a cloudy haze. 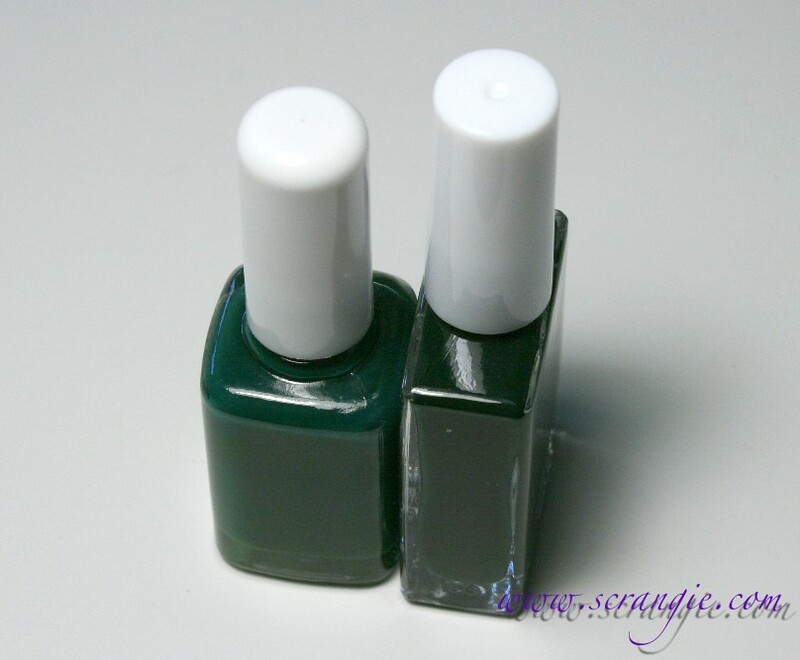 It is a true matte finish (not a satin), but it's not as chalky/ultra-matte looking as the Essie Matte About You topcoat. 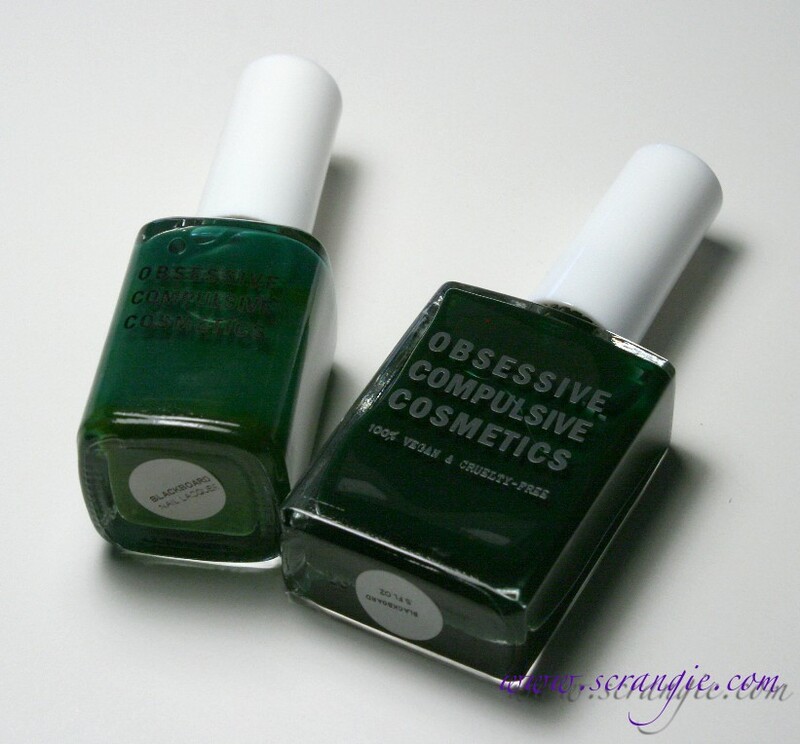 Obsessive Compulsive Cosmetics Nail Lacquers are 3-free and vegan. All shades are available on OCC's website and they retail for $8 (for 0.5 fluid ounces). Actually, now that I'm thinking about it, these new bottles are identical to POP Beauty's bottles, tall and slim with white plastic caps. Though I can't say I thought they were at all Essie-like before, I love Essie's bottles. They fit so nicely in Helmer drawers! I love Ghostly. But is it a dupe of Sally Hansen's Lavendar Cloud? Hmm... I'm not familiar with that Sally Hansen shade. I'm not sure if it's a dupe or not, sorry! Lavender Cloud is actually a good bit more white. I can see how you would think they are dupes at first glance though! I really like the finish of that matte top coat, especially on top of the red. Like the bottle shape. Wish it was a bit thicker. More like Rescue Beauty Lounge. Nice polishes. I don't own any of this brand. Wow, I totally want to matte my red polish now! I find the rectangular bottles a bit clumsy, personally, but they're certainly more eye-catching than the older bottles! Lindas cores, gostei de todas. Mas não tenho essas marcas. Pretty! Too bad I can't find ghostly on their website. I really like the new bottles.